NEW YORK—The annual Asia Week kicks off the month of March, one filled with Asian art and antiques on display in galleries across the Upper East Side. Apart from Asia Week’s 42 exhibitors, Asia Art Fair and The Japanese Art Dealers Association (JADA) exhibitions will take place March 14–17 and March 14–16, respectively. Asia Week 2015 runs March 13–21. 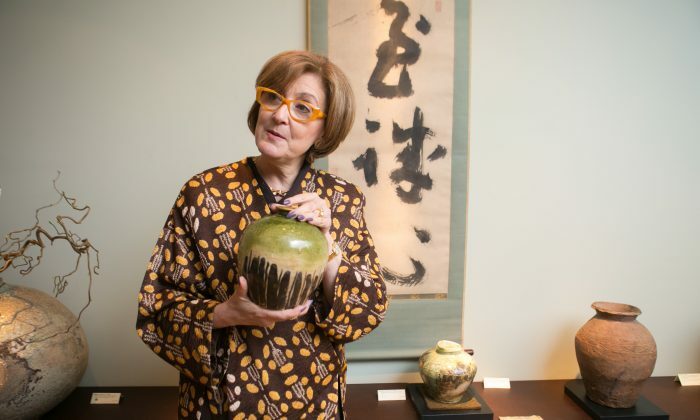 Continuing to show her love of Korean moon jars, Jiyoung Koo of Koo New York is featuring the work of ceramicist Lee In-chin. His ash-fired technique lends surprising color and texture effects to the moon jar form. Howard Wei from Belgium, noted for his fine, small Buddhist figures, presents an undated skeleton club from Mongolia. The piece, startling in its eeriness, was used to terrify demons in Tantric ceremonies. Michael Hughes has a trio of figurines depicting entertainers from China’s Warring States period (451–221 B.C. ), a rare find, considering that their gray and red pigments are still bright and clear. Japanese ceramicists deemed Living National Treasures by the Japanese government are heavily represented at Onishi Gallery and Joan Mirviss. Family dramas often play out over secret glaze recipes, making these vessels not only beautiful objects but repositories of legends. Kaikodo presents its reliable mix of elegant works with an emphasis on Jin Dynasty (12th–13th century) ceramics and literati painting from China. The Jin Dynasty was a pivotal period in the development of Chinese ceramic arts. Gisele Croës from Belgium, who made her Asia Week debut last year, returns with a collection of early Chinese smaller works—smaller in size, but no less impactful. She displays her knack for choosing imposing objects with a bronze sculpture of a 6-foot-tall celestial guardian from the late Ming Dynasty, a followup to one she showed last year that measured over 10 feet. Here’s a bit of cheekiness from furniture specialist Nicholas Grindley: a bird-walking stick. Bird-keeping was quite the thing in Beijing, and the paraphernalia that came with it. A bird-walking stick looks like a finely carved selfie-stick, only it has a peg on one end and a perch on the other. Other highlights: five years ago Grindley started dealing in historical photos by Westerners documenting the Yuanmingyuan and other fading places in Canton and Beijing. Some of these are on display. Sue Ollemans said she’s been in the business so long, she keeps getting historical jewelry shown to her. The U.K.-based dealer’s current exhibit includes dramatic and ornate necklaces, bracelets, and beads from far-flung places like Turkmenistan and Uzbekistan, Indonesia and Vietnam, and temples in the South of India. Erik Thomsen is known best for Japanese folding screens. Last year he presented intricate golden and enameled ones; his exhibit this year features looser brushstrokes and colors more subdued. Nearly all the pieces are from the Taisho Period of Japanese art (1912–1926), a short era that is nearly unrepresented in Western museums. That will soon change, Thomsen hopes. As of press time, a two-panel folding screen in his collection, finely painted with a pair of peacocks, is on hold for the Metropolitan Museum of Art. In a lively exchange, five collectors shared strategies for art collecting, as well as some triumphs and missteps in finding beloved artworks.